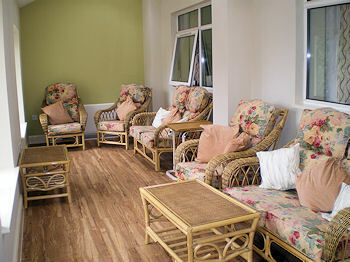 Why is a medium sized care home the best approach? As a medium sized home we can maintain the homeliness, friendliness and individualised approach of a small home. The staff team will get to know all of the residents and are therefore in a better position to tailor things to suit the individual resident’s needs and wants. As a medium sized home we also have the scale and depth to invest and do things correctly. For example, there are loads of different lounges all with different themes and atmospheres. This gives individuals much more choice. We have a hair salon, an activities rooms / cinema, four different gardens and a minibus for trips for example. The team itself is also broader and deeper. For example, within the kitchen we have two chefs, two relief cooks and kitchen assistants. This enables us to maintain standards week by week, year by year and ensures that standards do not drop if any one individual goes on holiday, is sick or leaves for example. Very small Nursing Homes (as opposed to Residential Homes) can not typically survive financially which is why it is becoming increasingly rare to find any throughout the whole of Wales.